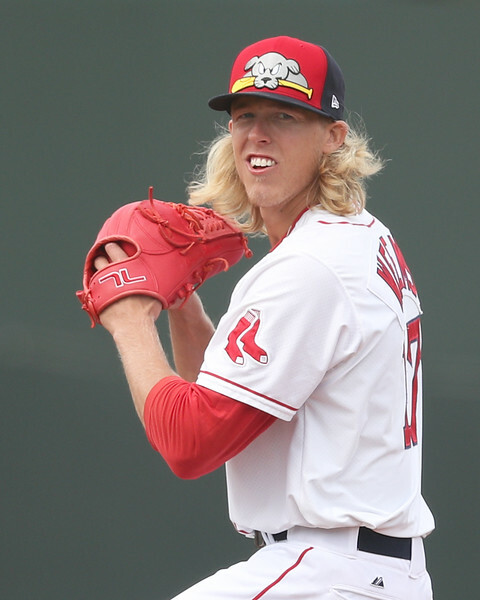 Jordan Weems (pictured) was selected by the Red Sox in 2011 as a catcher, but has transitioned to pitcher and has done well in Portland, writes the Portland Press-Herald's Kevin Thomas. The Hanley Ramirez era in Boston is officially over, as he was released on Wednesday after being designated for assignment last week to make room for Dustin Pedroia, who was rehabbing from knee surgery. Adam Lind will join Triple-A Pawtucket, as the Red Sox signed him to a minor league deal on Tuesday. Lind was released by the Yankees last week and after hitting over .300 with the Nationals in 2017, had not appeared in a major league game for New York. ESPN's Dave Schoenfield wrote about the best first-round pick, the best late-round pick and a player that was drafted that got away for each of the 30 teams. Roger Clemens was the best first-rounder, while 22nd rounder Bill Lee was the late-round gem. Boston drafted Mark Teixeira in 1998 but elected to attend Georgia Tech instead. His co-worker, Keith Law, published his Mock Draft 3.0 on Thursday and has the Red Sox as selected Seth Beer from Clemson. The PawSox stadium saga continues and Rhode Island House Speaker Nicholas Mattiello said on Wednesday that the latest proposal to keep the team in Pawtucket risks no taxpayer money, according to the Associated Press.